When I found out that a takoyaki joint was opening up in Philly, I was positively giddy. Maru Global finally opened in early February. It’s primarily a take-out joint. 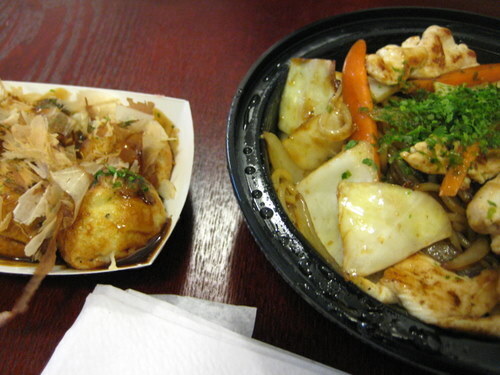 They sell various types of takoyaki, noodles, rice bowls, bento boxes, and some salads. 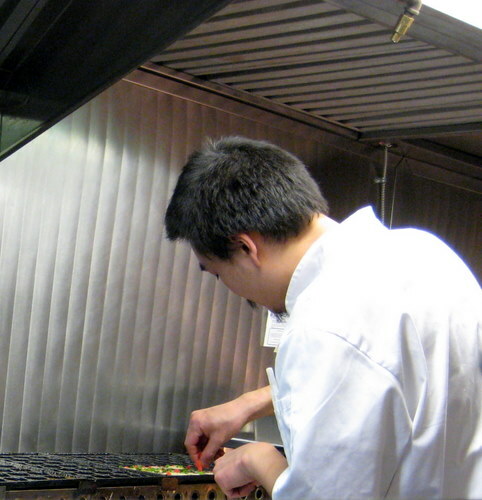 Here’s the owner making takoyaki. 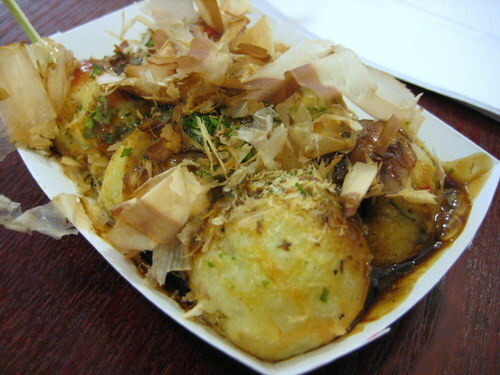 What is takoyaki? It’s a round ball of batter, filled with diced octopus and some veggies, topped with sauce, garnish, and bonito shavings. At least that’s the traditional takoyaki. 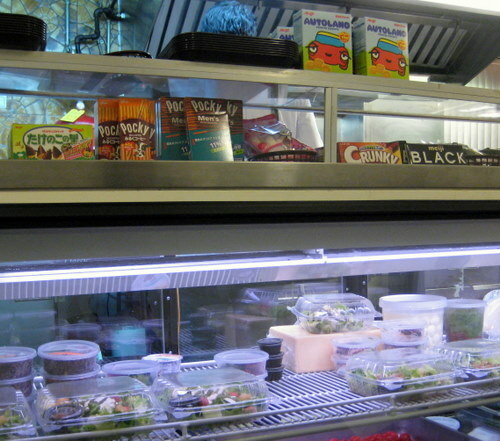 Maru also serves other flavors, including philly cheesesteak, pizza, bbq, and corn and salsa verde. I’m not quite ready to try those types yet. These balls are made on special takoyaki pans, which are half-sphere molds, and the batter is placed in the pan, and you have to flip the batter to form the ball. It’s pretty cool to watch. Along with traditional takoyaki, H/A got some yakisoba with chicken. Yakisoba is a noodle stir fry dish, which typically has cabbage and your choice of meat, in a special yakisoba sauce. It’s definitely savory. 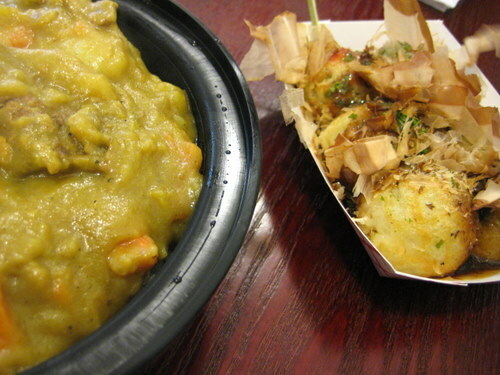 As for me, I got a curry bowl, because I have a thing for japanese style curry. Ok, so how was the food? I wish I could say it was great, but alas, it was just ok. The takoyaki were… too mushy. The balls wouldn’t stay balls. You should be able to stab your ball with the toothpick, and it should stay together, and you should be able to pop it in your mouth. But these balls, well these weren’t stabbable. They just kind of fell apart. There was no firmness of the outside of these balls. They were just mushy and gushy. I just wasn’t feeling how “uncooked” they seemed. Taste wise, they were ok. The curry? That was ok too. I got beef curry and it had one thumb-sized piece of beef in it. That was it. There was also potato and carrot, but the beef was severely lacking. I wasn’t impressed. The yakisoba wasn’t the best either. It was just ok as well. The takoyaki at yakitori boy are better, and the curry at maido is better. I was hoping to like everything, and while I did like it, there are other spots in philly that do it better. It was particularly disappointing because this place is a takoyaki joint! Oh sadness. They sell random japanese snacks as well. We got into a light conversation with the owner, and he’s super nice. I really hope that the food improves because while the food is ok, if it gets better, I would totally love this place. The prices are incredibly reasonable and you will be full. So let’s just hope they get through the growing pains!